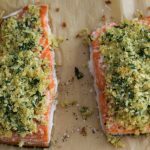 Dijon-Herb Crusted Salmon is healthy, fast to make, tastes delicious, and pairs well with Bonterra “The Roost” Chardonnay. Honestly, this is one of those recipes that can go either way; a great FAST weeknight dinner or a simple but elegant salmon entree for entertaining, paired with a Burgundian-style Chardonnay like Bonterra’s “The Roost.” Since eating more fish is always on my list of things to do, and salmon is usually my fish of choice, recipes like this one are useful to have in my arsenal of fish recipes. 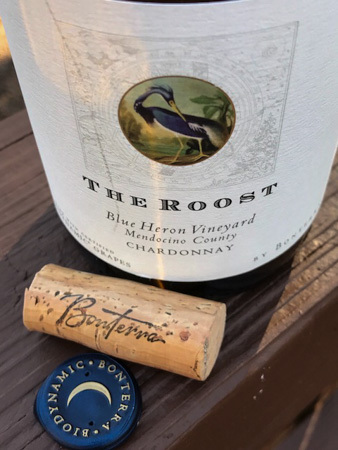 Disclosure: Bonterra The Roost Chardonnay was provided to me as a sample through my participation with #WineStudio a virtual online wine education and grassroots marketing program. The Blue Heron Vineyard certified Biodynamic is located between the shores of the upper Russian River and a Blue Heron nesting site. The climate is the coolest part of the riverbank location with the vineyard composed of ancient alluvial soils. The wine was fermented in French oak barrels, 30% new barrels, for 18 months. Lemon in color with a spicy fig nose. On the palate medium bodied and medium plus acidity. Notes of apple, citrus, nutmeg, crème brûlée, and an overall creamy mouthfeel. 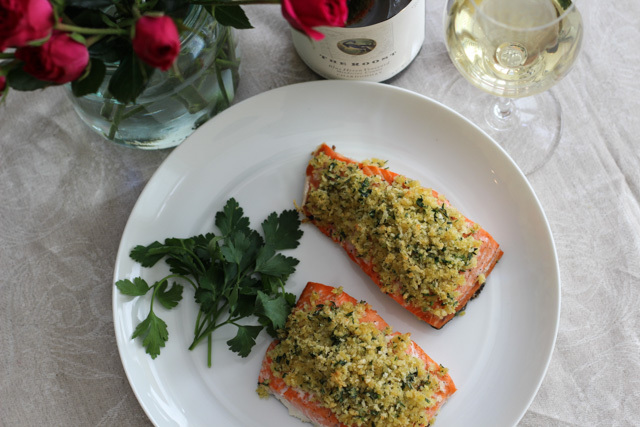 The acidity in the Chardonnay is a favorable match for the richness of the salmon, along with the herbs, and mustard. The crisp breadcrumbs add a nice textural contrast to the creamy mouthfeel from the wine. A fast dinner for the weeknight or a simple but elegant entree for entertaining paired with a Burgundian-style Chardonnay like Bonterra The Roost.